Creatively speaking, it’s fair to say that most designers are content to come to the party late, exploiting the innovative ideas of others that have proven successful. Continuing this analogy, Bill McMullen, on the other hand, always seems to be heading to the next party before most even heard of the last one. During a career that spans over twenty years, McMullen has been a member of Def Jam‘s in-house design team, The Drawing Board, as well as being an integral part of the now-defunct SwishNYC brand’s aesthetic. He’s developed memorable packaging for The Criterion Collection and the Beastie Boys, having been so involved in the latter that bandmember Adam “MCA” Yauch gave McMullen the enduring nickname Billions McMillions. And this is but the tip of creative iceberg that is McMullen, even beyond the fact that it doesn’t delve into his fine art installations and designer toy works, such as his 2006 released Shuttlemax from Kidrobot. Or his AD-AT creation, which this article will be focusing on, starting with the concept’s Old-School Invasion canvas piece origin. An Iris output, or giclée, on canvas, McMullen’s Old-School Invasion from 1999 has been alternatively referred to as Attack of the Shelltoe AT-ATs, which is a truly apt title. Framed in a letterbox border, this illustration merges icons of sci-fi and street culture, the general outline of the AT-AT, or All Terrain Armored Transport, from Star Wars having been augmented with aspects from the Superstar sneakers by Adidas, which have since been nicknamed the “shelltoe”. Smartly incorporating the iconic off-coloration between the Supertar’s white rubber toe box and white leather body, McMullen’s depiction brazenly finishes the vehicular forms off with Adidas’ three stripes branding. And while a memorable work, it proved to merely be the beginning to a much larger saga. Between 2002 and 2014 there would be several unique and limited edition versions of McMullen’s creation from Old-School Invasion, which became known in its sculptural form as the AD-AT. Ranging in size from the 6-inch tall AD-ATpoint5 to the 10-foot tall Giant AD-AT, this new title for the work referenced both its inspirations, the “AD” denoting Adidas while the general title’s structure stemmed from the AT-AT. Built upon an Imperial AT-AT Walker from the Kenner released The Power of the Force line of Star Wars toys, McMullen’s initial one-of-a-kind AD-AT was one of several altered AT-AT pieces for the Morgan Phillips curated Star Wars by Suckadelic exhibition. Held at SwishNYC’s Goto Store in the Lower East Side, this themed art exhibit was displayed from April 18th until June 18th, 2002, but this sculpture would soon receive a broader audience in edition form. Following 18 months of revisions and refinements, McMullen’s AD-AT was issued as a Limited Edition vinyl piece. Produced by Span of Sunset, this version was limited to 1000 copies, each accompanied by a signed photo card depicting the original Old-School Invasion work. And while it was available directly from the producer in late 2003, its official release is typically associated with a signing event McMullen had at Kidrobot’s New York store on February 28th, 2004. Following a decade of quiet concerning the AD-AT design, McMullen revisited the concept for 2014’s This is Not A Toy exhibition at Canada’s Design Exchange museum, with the artist constructing a roughly 10-foot tall rendition as a centerpiece sculpture for the show. Titled the Giant AD-AT, this one-of-a-kind work took approximately a month to complete, the piece itself being constructed from machined and formed wood as well as foam-shaping. Having transported and installed the sculpture himself, this work appears to have reignited McMullen’s interest in the AD-AT design, as two new editions soon followed. 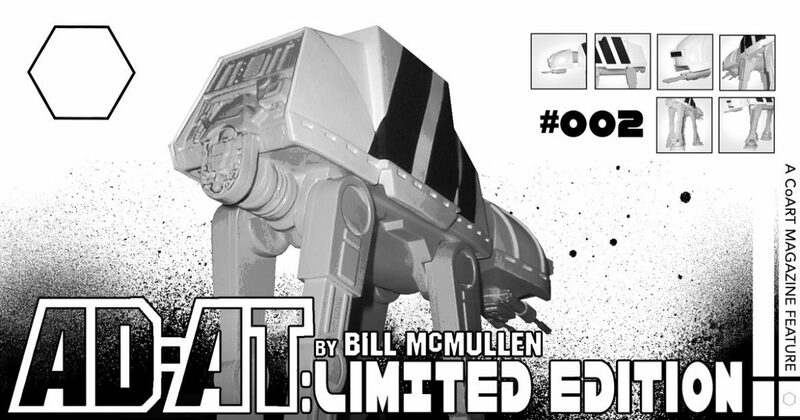 For 2014’s San Diego Comic-Con, McMullen hand-altered an edition of 10 Hasbro produced Imperial AT-AT toys in a similar manner to how the original “prototype” version was made. Packaged in a signed and decorated wooded box, each of these AD-AT: Custom edition pieces were accompanied by a 3¾-inch tall Joystik resin action figure with his boombox-shaped droid accessory, G2-B2. Described as “Joystik in NeoDetroit Escape Disguise” on its backing card, this was actually the sophomore outing for this piece’s design, following the Disturbance in Borough 6 edition from 2013’s DesignerCon (pictured below). And with July’s roughly 2-foot tall AD-AT: Custom edition being enthusiastically received by collectors, McMullen concluded the unofficial 10 year anniversary celebration of the design with the smallest version yet, the almost 6-inch tall AD-ATpoint5 edition. Making its debut at November of 2014’s DesignerCon, the AD-ATpoint5 were hand-painted resin sculptures, each contained within a miniature version of the original edition’s packaging. To complete this tribute to the vinyl release, these diminutive renditions were also each accompanied by a small replica of the Old-School Invasion signed photo card. A beautiful homage to the decade long endurance of this design, hopefully McMullen won’t wait until the 20 year anniversary to revisit it once more.